"I am a waterbag with a hole. Time is running out on me." Amid the vast landscape of inner Mongolia, two opposing clans are preparing for a bloody battle. Spurred on by an intense hatred for the other group, they cross the plains and begin a fierce conflict. Seated calmly on a nearby hill, the blind Old Master (Liu Zhongyuan) begins to sing a peaceful serenade about the stupidity of war. His words are fairly simple and provide a rather corny outlook on life, but they soon begin to alter the warriors out in the field. By the conclusion of his heartfelt song, they have totally ceased to fight and unite in their adoration of the wise elder. This moment deftly summarizes the entire story of Life on a String, which provides a peculiar experience of surprising emotional power. The solutions expressed are very straightforward, but their simplicity actually makes them more convincing and effective. Director Chen Kaige (Temptress Moon, Farewell My Concubine) gives each moment an impressive sense of tranquility within fairly barren scenery. There are numerous scenes of stunning beauty that overwhelm the smaller story. The plot follows the Old Master and his blind young follower Shitou (Huang Lei) as they travel through the land and discover new elements of life. The Old Master spends much of his time playing and singing memorable tunes to amazed villagers. He was raised to believe that following the breaking of 1,000 strings, his sight would be restored. Nearing the end of his life, he continues to play earnestly and tries to reach the desired goal. While the Old Master struggles with his failing health, he toils philosophically with the concept of his own death. Young Shitou stumbles behind his master through the land and cares greatly for the elderly man. The local residents regard him as a blind fool, but he possesses a considerable amount of caring and emotion beneath the surface. This hidden energy springs to life due to his burgeoning love for Lanxiu (Xu Qing)—an attractive young girl who sees beyond his physical limitations. Their tender moments create a new possibility in life for a person who has spent his early life in darkness and ridicule. Although it differs considerably from a conventional match, this relationship works nicely due to impressive chemistry between Qing and Lei and vivid cinematography from Gu Changwei. While the story is fairly engaging, it takes place more in an episodic fashion and succeeds in the visual sense. When the film ends, the elements that stay with you are images of majesty and power. These pictures combine with a melodic score to create a feeling of peace and tranquility. The highlights revolve around the courtship between the odd young couple and the Old Master's efforts to keep the citizens' lives on the right track. His final song is especially effective and helps to reveal Kaige's overall point of teaching compassion and hope for the future. A minor warning for less adventurous filmgoers: This is a slow-moving story that may easily lose viewers who focus on the lack of an easily understandable plot. Although I did enjoy the picturesque scenery, I did find myself drifting several times during the film. Audiences who prefer more conventional Hollywood studio releases might want to avoid this picture. Otherwise, enjoy the lush direction and more philosophical brand of storytelling. Image Transfer Review: Kino does an excellent job in spotlighting lesser-known foreign films that deserve greater recognition. However, their releases often fall short in terms of the visual transfers. 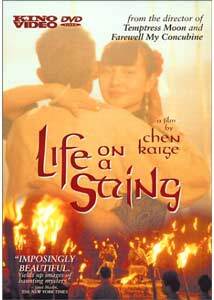 Life on a String corresponds with this pattern and offers a mediocre 1.85:1 widescreen transfer that contains a considerable amount of grain and defects. This movie features numerous shots of majestic scenery, but their effect is muted by the sub-par colors of this transfer. They lack the sharp brightness and definition normally expected on DVD releases. These shortcomings are especially unfortunate due to the impressive set design and vast landscapes presented during this picture. Audio Transfer Review: When the Old Master belts out his songs about compassion and living, this transfer presents them in an easily understandable fashion. However, their impression would be even stronger with a more complex audio track. There's nothing particularly wrong with this transfer, but it simply can only accomplish so much due to its technical limitations. The lush sounds of the Mongolian countryside and the often mournful score still work successfully in creating the proper atmosphere. The dialogue (if you speak Mandarin) is decipherable and flows nicely from the speakers. Given the basic format, this is a decent audio presentation. Extras Review: This disc offers nothing in terms of supplements except for a limited amount of scene selections. During the opening act of Life on a String, I found it extremely difficult to become emotionally involved in the lives of Shitou and the Old Master. However, the often-breathtaking images kept me interested until the story began to take shape inside my mind. Certain individual moments will remain with me for a long time, especially involving the elder character's struggle with death. Although the poor transfer and lack of extras slightly lessens this release, it is still recommended for a much different, yet charming viewing experience.